Be dazzled by gorgeous paintings from award-winning automotive artist Harold Cleworth. From illustrating the elegant curves of the multimillion-dollar 1936 Bugatti Atlantic, to perfectly depicting the brilliance of the head-turning red of Ferraris past and present, Cleworth brings an incredible photo-like quality to his work that not only captures the beauty of a car, but elevates it. With a precision that is beyond photography, it is no wonder that he is one of the world's most sought-after artists: commissioned by car companies to paint originals of their newest models, and by celebrities and private collectors to create portraits of their beloved automobiles. 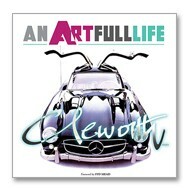 CLEWORTH: an ARTFULLlife is the first publication to compile his life’s work, and is a captivating visual journey of an illustrious career that has spanned almost four decades. A must-have for automobile aficionados, it features Cleworth's most highly coveted paintings to date, and the fascinating stories behind them. 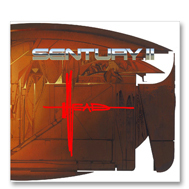 Syd Mead's Sentury II: The long awaited next book from legendary Syd Mead has finally arrived after nine years. 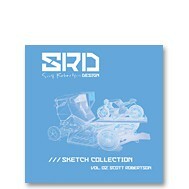 Loyal fans and art enthusiasts will rejoice in being able to view what Syd Mead has been imagining for nearly the past decade. Having illustrated the future for us for the past 40 years, Syd Mead continues to amaze and surprise us with his stunning pieces no matter how much of the future we have seen from the start of his career to the present day. 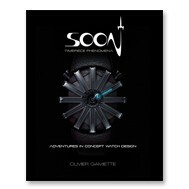 Looking through his unrivaled artwork, we still find ourselves continuously waiting for his future to be in our present. Images from countless conceptual projects as well as realized ones will be included in this fantastic visual voyage into the future with the only and only Visual Futurist, Syd Mead. Syd Mead (b. 1933 in St. Paul, Minnesota) is widely celebrated industrial designer, illustrator and “visual futurist,” known as the designer of cityscapes and vehicles for motion pictures including Blade Runner, Tron, Star Trek – The Motion Picture and Mission to Mars. After graduation from Art Center College of Design in Pasadena, Mead worked briefly as an auto stylist for Ford Motor Company. 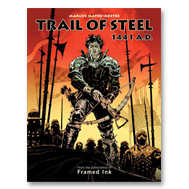 For US Steel, he designed and illustrated books that envision the use of steel in the future societies. 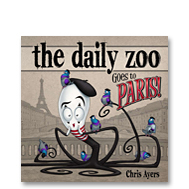 Following in the successful paw and hoof prints of The Daily Zoo: Volume One comes another exotic menagerie of creative fauna from Hollywood artist Chris Ayers. 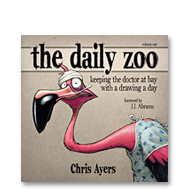 The Daily Zoo 2 offers more furry and feathered friends along with continuing reflections on his life as an artist and cancer survivor. 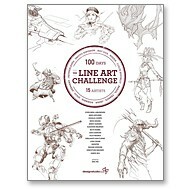 And, as with Volume 1 and perhaps more so, regardless of your artistic experience, this book will leave you inspired to grab the nearest pencil, pen, brush or crayon and start drawing … for fun and perhaps as a way to bring healing! 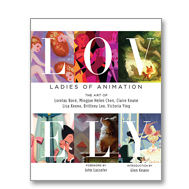 A portion of the proceeds from this book will support cancer-related charities and research; the current recipient is The Leukemia and Lymphoma Society. 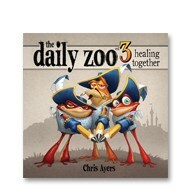 In the spring of 2005 Chris Ayers was busy working as a concept artist in the Hollywood film industry. That came to a crashing halt when he was diagnosed with leukemia on April first. 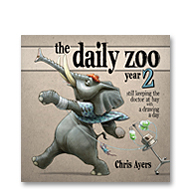 After a year-long period of treatment and recovery he started a sketchbook called The Daily Zoo on the anniversary of his diagnosis. 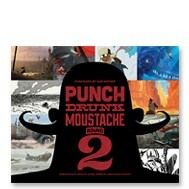 Over the next 365 days he would draw one animal each day, challenging both his self-discipline and imagination. Most importantly it would allow him the focused opportunity to celebrate the gift of each healthy day. 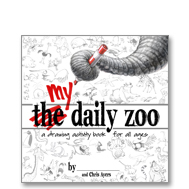 The pages of The Daily Zoo: Volume One are chock-filled with the first year’s 365 distinct critters, ranging from curious pandas to sinister hyenas, athletic aardvarks to zealous zebras, with the choice of artistic styles as diverse as the subject matter. Alongside the images, Ayers ties in commentary about his cancer experience, the sources of his artistic inspiration and his creative methods. 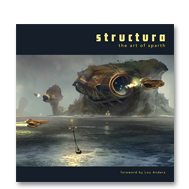 Regardless of your artistic experience, this book will leave you inspired to grab the nearest pencil, pen, brush or crayon and start drawing! *A portion of the proceeds from this book will support cancer-related charities and research; the current recipient is The Leukemia and Lymphoma Society.